Another early start in Tokyo not because of the time difference but from excitement at going to the Tokyo Motor Show, one of the biggest motor shows in the world! After the usual coffee at the nearby café I watched the crowd of commuters build up. This place was busy! Now, although I knew where the show was I didn’t have an event or train tickets. Rather than use the machine I went to the information and ticket selling counter. There where no English staff so I simply showed them the brochure I picked up in the office that showed the motor show. They seemed to know what I meant – I forgot to bring my Japanese phrase book. ¥1300 Yen later I thought I had a ticket train ticket to the show. The show opened at 10am but it was only 7:30am which happens to be peak hour. So the trains where going to be cramped. The station itself was already full of people rushing about in an orderly fashion and at the platform the station crowd pushers with their white gloves where standing by! Getting on the Japanese train at this time of day is overcrowded, which means squeezing in with all the others. Expect to be pushed up against at least another person. That is what the train staff with white gloves are for. If you don’t like being pushed up against someone you don’t know then you should try some other time. During peak times there are no seats. Yes they literally push people in. Thankfully the train ride doesn’t last to long and everyone incredibly exits the train in one mass, no worries and no fuss. Once out of the train we hang back and wait for the masses to go though the first exit and follow the stragglers before the next train arrives and before the next lot of travelers start arriving at the platform. It’s quite fascinating to watch. Remember you are on holidays so why not? Central is as usual packed with people arriving in for work so the exit lines are full but the walk way to the Keiyo line is not so crowded since it is going to the suburbs – so to speak. So a very very long walk to the platform was interesting and certainly full of people going the other way. Once on the platform it was decision time – take the express, limited express or regular. Made the mistake of taking the limited express because there are less stops there are more people. The regular one just left actually had seating room – oh well. There’s not much difference in trip time either so choose what ever. The Makuhari Messe stop was 30 minutes away and the surrounding area you pass are not particularly interesting. The whole area is very flat and literally grey, buildings all spread out. The greenery is very well organised as always. The train carriage wasn’t as modern as the central Tokyo ones, not having video screens but at least the bright advertising was still present. Exiting the train we then lined up for tickets to the event. Then ran into a bit of trouble! The train tickets we supposedly bought weren’t train tickets, they where event tickets! We now had to sets of event tickets! We then went to the ticket adjusting people to sort it out and they refunded the extra tickets and let us through. I presume they thought we where just stupid foreigners. I also assume that they encountered a few of us like that since they knew what to do. So we finally arrived and walked another 10 or so minutes to the actual entrance. The area was huge and I could tell I was going to have a great time! 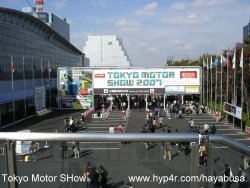 The 40th Tokyo Motor Show was bigger than prior shows because they where showing trucks, buses and motorcycles at this year’s event. It’s more interactive than some shows since you are allowed to try various models. For example you could actually sit on a new Hayabusa - complete with interactive display. There where lots of highlights for me independent of the more publicized models. For example the production version of the Honda DN-01 was 99% of the original show model from a few years ago. There was nothing else like it by any other manufacturer and the fact that it was going to be an 08 model pricked my interest. I hope they’ll release it in Australia. See the menu for part 2!